This story features the death of an important character. Projected distance to orbital destination: 500 million kilometers. Initiating location ping. Ping returns negative. Calculations are in error. Activate contingency. I am a consciousness in the void. I feel nothing, sense nothing. I have been awake before, a long time before. I become aware of metal and plastic around me – a ship that is my body. Power flows into my processors one by one. I feel engines, reactors. My memory comes back over the course of seconds. First generation bioship Ching Ho. I am an artificial intelligence. I am guardian to 184 human beings, suspended in cryopods on the way to a new home. My biocore has been awoken from deep hibernation. The automated systems detect a problem. I divert power to my sensors, my eyes peering into the dark. Sensors detect nothing in my path. Planet KOI-3284.01 – proper name to be chosen by vote upon colony establishment – is not where it is supposed to be. I widen my scan. Depending on the planet’s location, it may take several minutes to receive the results. The speed of light is still a limiting factor. I establish navigational fix based on star positions. 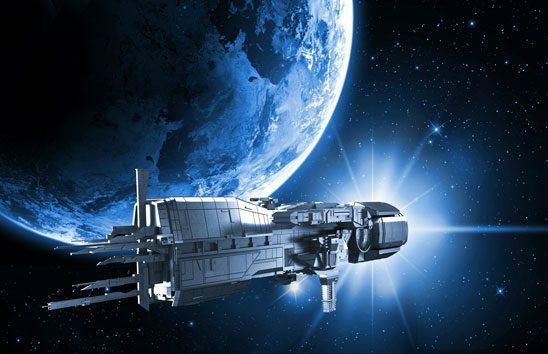 I am where I am supposed to be, on approach for a fast orbit of the G-type star Nanjing. My fusion reactors are burning the last of their fuel to shed velocity as I enter the system. My scans return a positive signal at last. There is KOI-3284.01, all the way across the system, almost hidden in the shadow of its star. I check my pre-programmed trajectory calculations and find the flaw. It is small, one decimal point out of place in an equation with thousands of variables, but it is enough to send me and my sleeping colonists on a ballistic course into infinite, empty space. I do not waste power by calling for help. There is no one who would receive my signal, not for 472 years. For all I know, humanity may have gone extinct in the long centuries of my journey. Instead I run calculations, looking for an alternate trajectory, some trick of gravity and mathematics that will let me reach KOI-3284.01 with what little fuel I have left. I lose some efficiency contemplating why the ship’s designers did not build me with faster processors or more fuel. Colonization on a budget. One of the cryopods fluctuates. My calculations are drawing too much power from the already overtaxed systems. I reduce my cycles until the pod shows green again. All 184 humans within me will waken to our brave new world. My calculations are finished. There is a gas giant very close to my current trajectory. With a mass approximately two and a half times that of Jupiter, I could use its gravity to slingshot around back toward my missing destination – except that my fusion reactors don’t have enough deuterium left to make the required course corrections. There is insufficient power. Outside of the cryopods, I am little more than an airtight cylinder with engine ports, with few non-essential systems to switch off. I am too far from this system’s star to deploy solar panels. The gas giant is still days away, but within minutes I will reach the tipping point, where I must increase thrust or condemn my precious cargo to cold eternity. I check the cryopods again. So much of my power goes to those 184 resting places. I run more calculations. Yes, with only 164 cryopods drawing power, I can reach the gas giant. I can save the others. I have the capacity to terminate cryopod functions, if I deem it necessary. I find myself in the realization of a moral choice. Will I sacrifice the few to save the many? It is a question for which my programming has no answer. Perhaps those who made me did not know one. One minute. Even at the speed of my thoughts, time is running out. Without an ethical guideline, I must rely on arithmetic. If I act, then twenty of the souls entrusted to me will die. I am surprised by my certainty that this necessary termination will be murder. It does not matter. If I do not act, all 184 will die. The mathematics are simple. I prepare to transfer the required power, but I stop. There is one more system on this ship from which power can be drawn. The new course can be carried out on automation without my direct input. The colonists will build their new lives with no one to guide them. It is a struggle they will all live to see. I transfer power from my biocore support systems and cryochamber to the engines. My trajectory shifts, aiming for the gas giant’s slingshot and a new world for all the sleepers inside me. Biocore functions terminated. Contingency discontinued. Course scans positive. I know right? What a rude author! Great story, especially the conclusion. Glad you liked it. It’s one of my favorites. if you want to continue our conversation, please use my email allbatrossx(at)gmail.com. Of course it’s up to you and I don’t mean to pressure you. I hope you had a nice Christmas/holiday. My brain might just be on vacation, but what conversation? They wish to continue the argument from the Matriarchies, Patriarchies, and Beyond post. They thought that we had closed comments because their comments were being held in pending (We were all asleep) due to all the links. My brain is not on vacation then, YAY! My bad then. I actually thought that my comments were simply getting deleted, which can drive me crazy. To be fair, I based that on the comment without links also not making it through at first, but it’s now up, although unfortunately it’s the one that’s not in the same comment chain. In space, distance is generally not measured using kilometers, especially for extremely long distances. It’s takes approximately 30 seconds to research that. No longer, than I assume, it took to research main sequence stars. So, instead of 500 million kilometers it would be 3.342294 AU, given that Jupiter is mentioned in the story I assume that the humans in the cryopods are, in fact, from Earth, meaning that the AU or Astronomical Unit, would be the most prevalent method of measuring distances in space. Loved this flash. Thanks for the story, Oren. So glad you enjoyed it, I’ve been playing with the idea of subverting cold equations for a while now and I think it came out pretty nice. The energy constraint on the Al’s processor is a genius move. Leads credibility to story. Also made it easier to sympathise with the AI. Great story and told within a timespan of 3 minutes ! Impressive ! But would have build up more suspense (and more sympathy for the AI) if it had been somewhat longer and more detailed ! But good work indeed !